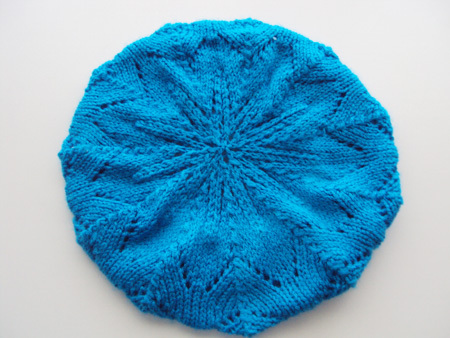 Sunday night I started to make this beret, but I didn’t do much because I wanted to do it as fast as possible. In Monday I knitted a little bit but nothing really special even though I made some progress. I wanted to do it during the week but I wasn’t able to do it, Friday and yesterday night I’ve been doing my beret and only left 4 rows to knit today 🙂 I really like it, I think the pattern is really pretty. No Domingo à noite comecei a fazer esta boina, não fiz muito mas gostei tanto dela que queria fazê-la o mais rápido possível. Na Segunda fiz um bocadinho no autocarro mas não foi nada de especial apesar de já ter começado a fazer progressos. Queria ter feito alguma coisa durante a semana mas pouco fiz, na Sexta e ontem à noite estive a fazer a boina e apenas fiz 4 filas hoje de manhã 🙂 Gosto bastante dela, acho que é um modelo super bonito. I steam blocked it but I’m not sure if it’ll stay this way. Eu usei o ferro para o bloquear mas não sei se vai continuar desta forma. That’s adorable! I love it. Fantástico! Um modelo bonito, mas muito difícil! boa semana!